Here we go again, for another round of misrepresenting Mojib Latif’s work showing a levelling off of temperature followed by rapid warming. This time it was kicked off by the cold spell over parts of Europe and North America. But it is worth noting that the Arctic is much warmer than usual, and it is rather warm here in Vancouver as well, so much so that there are worries about there being a snow shortage for the upcoming Winter Olympics. Take a look at the above graph, what do you see? Does it look like a cooling trend? Nope, but according to the crack reporters (or is that reporters on crack?) over at the Daily Mail it certainly does show cooling. 30 years of cooling, perhaps even a mini-ice age! Britain’s big freeze is the start of a worldwide trend towards colder weather that seriously challenges global warming theories, eminent scientists claimed yesterday. The research has been carried out by eminent climate scientists, including Professor Mojib Latif. He is a leading member of the UN’s Intergovernmental Panel on Climate Change. That last paragraph should be enough for any reader with even a basic understanding of the science to stop trusting anything said in the article. No single model says that the warming trend “since 1900 has been driven solely by man-made greenhouse gas emissions”. Climate models take into account many climate forcings (including but not limited to GHG emissions). In fact up until the 70s much of the temperature trends could be explained without GHG emissions. But apparently the Daily Mail isn’t one to let reality get in the way of a good story. The paper referenced by the first Daily Mail article, is “Advancing decadal-scale climate prediction in the North Atlantic sector” and is the source for for the above graph. How on earth does one get a cooling trend from the above graph? IPCC scientist [Latif]: Global cooling headed our way for the next 30 years? Again take a look at the above graph, does it show cooling? He had me reread the quotes attributed to him a number of times, asking twice, “those are direct quotes?” After I did, he said to me: “I don’t know what to do. They just make these things up.” I suggested asking reporters to read quotes back to him. Latif has NOT predicted a cooling trend — or a “decades-long deep freeze” – but rather a short-time span where human-caused warming might be partly offset by ocean cycles, staying at current record levels, but then followed by “accelerated” warming where you catch up to the long-term human-caused trend. He does NOT forecast 2 or 3 decades of cooling. Was it too much trouble for the Daily Mail, Fox News and Anthony Watts to verify with Latif that they were accurately representing his work. Of course it was, because Latif’s work is contrary to the point of view they wish to push. But don’t expect this denier myth to die anytime soon. They have constructed a monotonic straw man, and they take great pride in tearing it down as often as possible. Given all the warnings about and plans to forestall global warming, people may be surprised to find,over the next several years that, over parts of the Northern hemisphere, summers are no warmer than before, maybe even a bit cooler–and that winters are as cold, or a bit colder, than they have been in the past couple of decades. 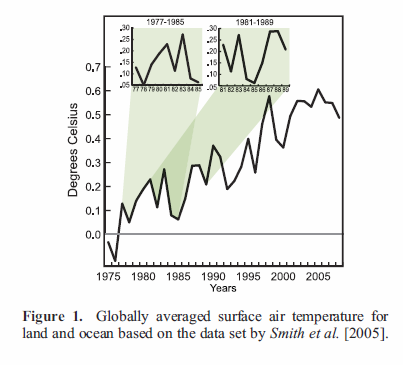 The past record of globally averaged surface air temperature illustrates how gradual warming and short-term fluctuations can operate side by side. The temperature ups and downs superimposed on the 20th century warming trend reflect the natural variability. To some extent, we need to ignore these fluctuations, if we want to detect the human influence on climate. Consider, for instance, the mid-century warming that was observed from 1930 to 1940. Had forecasters extrapolated into the future, they would have predicted far more warming than actually occurred. Likewise, a brief cooling trend, if used as the basis for a long-range forecast could erroneously support the idea of a rapidly approaching ice age. Natural climate variations may be produced by the climate system itself. A well-known example is El Niño, a warming of the Equatorial Pacific occurring on average about every 4 years. The record El Niño 1997/1998 helped to make 1998 the warmest year to date. The last year happened to be a moderate El Niño year, one reason, for instance, for the weak hurricane season in 2009. Volcanic eruptions and fluctuations in solar output can also bring temporary climate change. The Philippine volcano Mt. Pinatubo caused a temperature drop in 1991. And an increase of the solar radiation reaching the earth contributed to the mid-century warming. We predict the coming years may see two natural oscillations, the Pacific Decadal and the Atlantic Multidecadal Oscillation, swinging into their negative phase, leading to a cooling of sea surface temperatures in large parts of both the Pacific and Atlantic. A temporary halt in the global warming trend may be the consequence — nothing surprising to a climate scientist. It is also possible that the current El Niño, combined with the long-term warming trend, takes us to record temperatures this year — again, nothing surprising to a climate scientist. Pro tar-sand bias in the Canadian government?